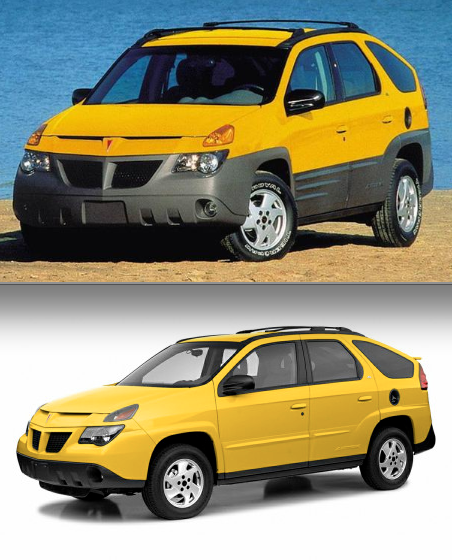 I’m not quite prepared to suggest that Pontiac’s Aztek crossover would have sold well if it had been launched as a 2018 model, but I am willing to propose that it might have been better received in today’s marketplace than it was when it debuted back in 2001. 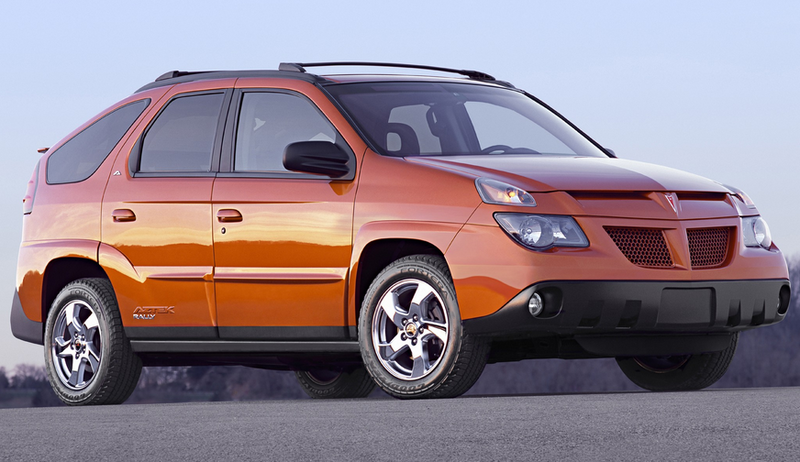 Crossover design has certainly become bolder since the Pontiac Aztek came and went. 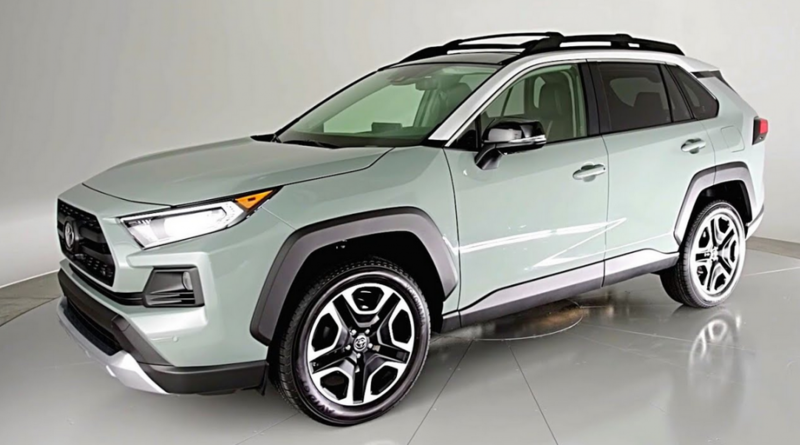 The redesigned-for-2019 Toyota RAV4 is seen here. I am cool with using the word ugly to describe the Aztek, and I can’t defend this much-maligned vehicle’s lack of visual harmony—or frankly any continuity—that might tie its various design elements together. But… (here it comes)… many of today’s new crossovers feature extremely extroverted design elements, including the type of body creases and folds that defined the Aztek’s look. Yes, most—maybe all—of these contemporary crossovers look better than the Aztek did, but the similarities are there. But even if you don’t accept the Aztek as ahead of its time design-wise, it was Pontiac’s first crossover—and that’s something. When it launched for 2001, Aztek was meant to give Pontiac a vehicle with which to draw customers away from the popular midsize Toyota Highlander, and to a lesser extent the compact Honda CR-V, and even the Chrysler PT Cruiser. 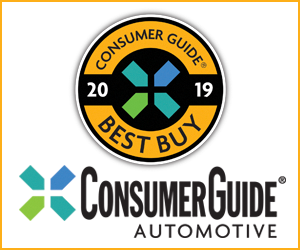 Responding quickly to reviews critical of the vehicle’s styling, Pontiac freshened the Aztek for the 2002 model year, dialing back the gray-plastic cladding and generally smoothing out the overall appearance. Sales held steady that year, but tumbled after that. A hasty 2002 freshening went some distance in smoothing out the Aztek’s overwrought design. Even with its cleaned up look, the Aztek still looked oddly tall and bulky. The odd stance came as a result of the Aztek’s humble minivan roots. To save money and reduce development time, General Motors brass opted to use the company’s front-wheel-drive van architecture as the foundation for the Aztek, despite the limitations this decision would place on designers. Note that the mechanically similar Buick Rendezvous—which was built alongside the Aztek in Arizpe, Mexico—shares the Aztek’s bulky, high-roof profile. 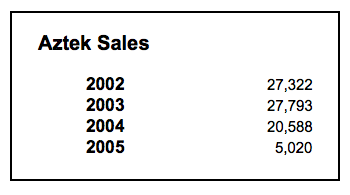 With sales in steep decline, 2005 proved to be Aztek’s last model year. 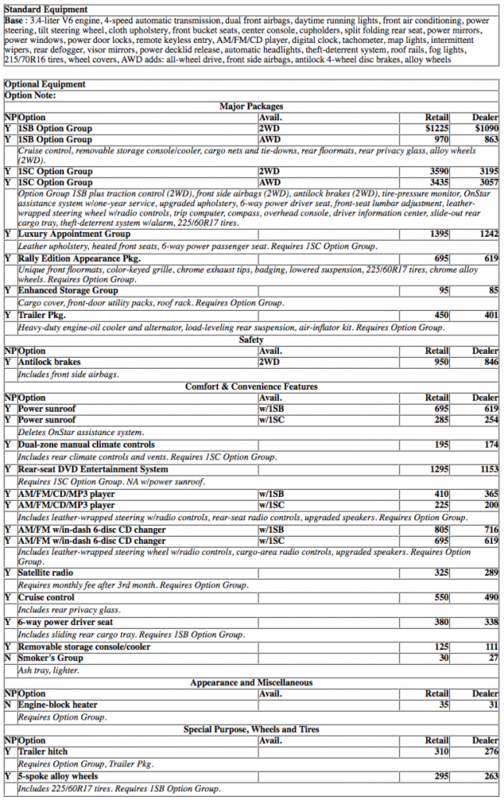 Shared here is Consumer Guide’s original review of the swan-song ’05 model, including prices and specs. If you’ve ever spent time with an Aztek, please tell us about it. The place for comments is down below. What did Walter White Drive? This slow-selling car-type SUV stands pat for 2005. Aztek is based on GM’s minivan architecture, but has four swing-open side doors and a combination liftgate/tailgate. It’s similar to the Buick Rendezvous, but that model has a longer body with different styling, one-piece liftgate, and seating for up to seven instead of five. Aztek comes only with a 3.4-liter V6, automatic transmission, and either front-wheel drive with optional traction control or GM’s Versatrak all-wheel drive. Versatrak lacks low-range gearing and isn’t designed for severe off-road use. Antilock 4-wheel disc brakes and front side airbags are included with AWD, available with 2WD. Among package options is the Rally Edition group with unique trim inside and out, lowered-ride-height suspension, and 17-inch alloy wheels vs. standard 16s. Also available: rear DVD entertainment, GM OnStar assistance, leather seating, satellite radio, in-dash CD changer, and CD/MP3 player. An optional trailering package allows towing up to 3500 lb. Like its minivan parent, the front-drive Aztek has smooth acceleration and good midrange response, but no surplus of either. AWD version is some 260 lb heavier and somewhat slower in most situations. Test front-driver averaged 18.7 mpg vs. 19.4 for our AWD over more highway miles. 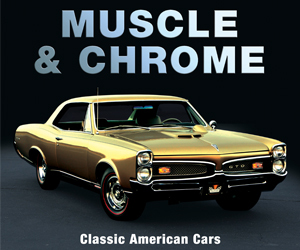 Pontiac recommends regular-grade fuel. Generally absorbent and well-controlled. Minivan roots yield better bump absorption than in most true midsize SUVs, but uneven surfaces induce some side-to-side body motion. Heavier AWD model not quite as comfortable. More minivan than typical SUV. Unstressed in routine driving. Good cornering grip, but fast turns induce marked body lean. Front-drive models too easily buffeted by strong crosswinds. Stopping ability more than adequate with available ABS, but test 2WD had mushy brake-pedal feel. No opportunity yet to test a non-ABS Aztek. Relatively low noise levels from all sources. Few SUVs are this quiet. Dashboard festooned with unnecessary bulges, coves, odd shapes, but gauges and controls are designed and located sensibly enough. Mostly budget-grade cabin materials a big letdown. Front: Comfortable seats and positioning, though taller drivers may wish for more rearward travel. Thick roof pillars impede over-the-shoulder vision, and driver can’t easily see front body corners. No rear wiper available, and the sloped liftgate glass is fast clouded by wintertime salt and slush. Minivan-low step-in eases entry/exit. Rear: Enough space for 6-footers. Bench seat is more springy foam than supportive padding. Passengers must twist feet to get in or out, and large doors are cumbersome in tight spaces. Cavernous and versatile. Console doubles as a drink cooler, door map pockets have twin bottle holders. Rear bench easily removes in two sections, and an available rear storage tray is clever and useful. Aztek carries 4×8 plywood sheets with the tailgate lowered, but the gate doesn’t lie completely flat and the large glass liftgate is heavy. Aztek scores comfort points over most truck-type SUVs and offers lots of nifty features for active folks, but it can’t go far off-road even with AWD. Worse, it lacks a “quality” look and feel, and 2WD buyers must pay extra for the safety of ABS and front side airbags. Continued slow sales mean ready discounts. Aztec production is scheduled to end in 2005. Written by: Tom Appel on September 28, 2018.on March 22, 2019.